What does MICR stand for? What does the MICR do? Do I need to use MICR ink or toner when printing checks? Why can't I find MICR ink for my inkjet printer anywhere? Why is MICR toner only available for a few printers, mostly HP? Is MICR pronounced my-ker or micker? 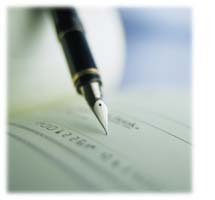 Negotiable documents like checks and money orders have a special line of numbers and symbols located on the bottom of the check. These characters are printed in a special font with magnetically chargeable toner. Financial institutions and the Federal Reserve process negotiable documents with high-speed reader/sorter equipment. These machines give a magnetic charge to the bottom of the check and then read the MICR line in three hundredths of a second. Checks travel through reader/sorters at 20 miles-per-hour or 2,400 documents per minute. As the "average" check travels through the banking system it is read seven times by reader/sorter equipment in many locations. Some checks are fed through these machines up to 20 times. The high-speed automated processing of negotiable documents depends on the accuracy and the integrity of the MICR line. Yes! But first, let us clarify that we are talking about products that print checks on blank check/security paper and not printing on checks that already have the bank and company information preprinted on them. The check processing system is based on the special numbers and symbols on the bottom of checks (MICR) to be recognized magnetically by devices called reader/sorters. Dot matrix, inkjet and many laser printer inks and toners have *no* magnetic properties. Some laser printer toners have limited magnetic properties, but well below what the standards call for, and without being formulated for passing through reader/sorters as many as 30 times (another requirement). When a check cannot be processed automatically, the reader/sorter "rejects it". The MICR information must then be manually re-keyed by someone on a special encoding device, a correction label applied to the bottom of your check, and then it is resubmitted. This is obviously an expensive process, and slows down the processing/clearing of your check. Many people have had the misfortune of buying a package claiming to allow them to print their own checks on any printer. Some time later, their banks contact them to let them know that their checks are rejecting, and if they do not correct the problem then they will be subject to service charges (as much as $3 per check!). There is a partial truth behind the claim of being able to print your own checks using any printer. Banks are increasingly adding optical recognition to their processing systems. However, in most cases the optical systems only assist the magnetic systems. The bigger problem is that even if *your* bank is able to read your non-magnetic MICR encoding, in most cases your bank is the last one to process your check. It is the banks of all the people that you write checks to that have to deal with the problem. It works like this. If you write me a check, I deposit it at *my* bank. My bank's reader/sorters try to process it automatically and if they can't, they have to do it manually as described above. But even if my bank's equipment is able to read it, it then goes to a Federal Reserve processing center. Finally, it ends up back at your bank for processing. One exception may be the printing of bank drafts (e.g.. "check-by-phone" and "check-by-fax" systems that allow you to take check information from your customer over the phone and print a bank draft that you deposit directly at your bank). In this case, if your bank happens to be completely optical, then you may be able to print without MICR ink or toner. But you will have to check with your bank first. So if you have an inkjet or dot matrix printer, we do not recommend printing your own checks. If you have a laser printer, MICR toner may be available for it, especially if it is made by Hewlett-Packard or IBM/Lexmark. But there is one more caveat. Many of these products use very poor MICR fonts and/or their software do not properly position or space the MICR printing. If you plan to print your own, work with your bank. Take them samples for quality testing before you start using checks you have printed yourself. If you have not already purchased the "print-your-own" package, ensure that you can obtain a refund if the samples fail your bank's quality test. MICR has a very precise specification so that checks can be processed at a very high speed. One aspect that is critical for reliable MICR readability is consistency. Unfortunately, because inkjet inks are liquid, the materials that would be added to make them magnetically settle to the bottom. As a result, inkjet is not a suitable technology for MICR printing. Why is MICR toner only available for a few laser printers, mostly HP? MICR toner, just like standard toner, has to be formulated for each printer "engine". As you have probably noticed, there are hundreds of models of laser printers. Since MICR is not a mainstream product, there has to be sufficient demand for a toner manufacturer to invest in formulating a MICR toner for a specific printer engine. HP continues to have the largest market share (by far), and as a result MICR toner is available for most HP laser printers. Your next best bet is IBM/Lexmark and Xerox, for which there are several models that have MICR toner available. Other than that, you will have to shop around to see if a MICR toner is available for your printer. Note that even though your printer may not be listed, it may actually be using a printer engine that is the same as in a supported model. Technically, MICR is an acronym and therefore should be spelled out (M,I,C,R). However, we have it on good authority from one of the original developers of MICR that those "in the know" and from several industry leaders, that it is pronounced my-ker. Congress established the Federal Reserve System (FRS) in 1913. Today most commercial banks in the United States belong to the FRS. Many other depository institutions provide banking and checking account services to the public. These other institutions, such as some credit unions, savings and loan associations and nonmember banks, are not formally part of the FRS. However, they have access to the payment services it provides and are subject to many of the FRS regulations. In 1958, because of the explosive growth of check usage, the American Bankers Association selected the E-13B MICR font and the MICR system as the technology for high-speed check processing. Today, check standards are determined by the American National Standards Institute (ANSI), Accredited Standards Committee (ASC), X9B, of which Source Technologies is a voting member. The latest versions of the standards and technical guidelines are available from the American Bankers Association (ABA). ANSI X9.7 Specifications for Bank Check Background and Convenience Amount Field. Standards can be purchased by contacting the ABA at the above address. Some recent standards are also available for purchase on-line from NSSN, a national resource for global standards.